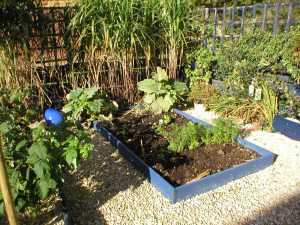 Professional gardener in Wantage: also offering tuition and talks, selling plants and seeds. I'm a Professional Gardener and Plantsmith, working in a number of private gardens in and around Wantage and local villages. I also offer garden teaching, both for complete beginners and for more experienced gardeners- real, hands-on, dirty fingernails gardening. This can be on a one-to-one basis for individual help: or for small groups of up to four persons..
Or are you thinking about starting up as a gardener: would you leap at the opportunity to work alongside a real gardener for half a day, to see if you would like it, and to see how it is done? I've already written the book on how to be a self-employed gardener (I'm not kidding, see below!) and now, thanks to the generosity and bravery of one or two of my Clients, I am able to offer you the chance for some practical, hands-on work experience in real gardens, alongside me, a real gardener. I have a daily blog, which I try to update weekly (er hem). For many years I have been working as a volunteer on the Wilts and Berks Canal, and I have created an interactive map of the Canal, showing all the places of interest. In my spare time (!) I sell hardy plants: for details, zip over to GreenPlantSwap. This is a very useful website, designed to help you find local growers, and to encourage people to not only sell plants, but to consider swapping. All my plants are propagated in my own garden, here in South Oxfordshire: they are local plants, accustomed to our local climate, and toughened up by my cold, east-facing garden. When out gardening, I normally work a four hour morning and then a three hour afternoon: most of my week is filled with my regulars, but I try to keep a little time free for one-off work. 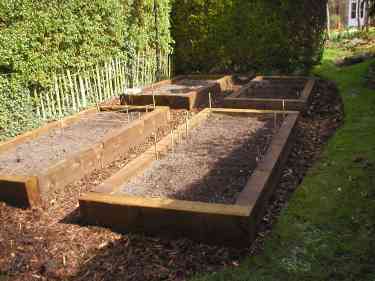 I'm not a contractor, I don't have a team, so I don't usually undertake "makeovers", although over the last couple of years I have installed a number of easy-care vegetable gardens for clients wanting to reduce their food miles, and I suppose that you could call them make-overs. This one was shoehorned into the end of a very long, thin, garden, where it just about gets enough sun! This one is about the smallest so far, measuring just 8' x 4', and set in a decorative shingled garden. As you can see, room for courgettes, carrots, dwarf french beans and a selection of spring onion and lettuce: flanked by raspberry bushes, and a dwarf apple tree, making a well-balanced contribution to "Growing Your Own" without taking up too much space. Vegetable gardening has become so popular that I have written two books on the subject: the first is about creating a Vegetable Garden within your own garden, the other is about taking on an Allotment for the first time. They are eBooks, published on the Amazon Kindle platform, and are available to download for free if you have Kindle Unlimited. You don't even have to have a Kindle to read them, as Amazon kindly provide a free "app" (or "program" as we grown-ups call them) allowing you to download their eBooks to your own mobile device, or even to your own PC. So there is no excuse! I tend to get very fond of my clients' gardens (and my clients, of course) and am often involved with redesigning as well as doing the actual work. I prefer to work in fairly large gardens, and yes, I work all the year round, weather permitting. I have excellent local references, which can be supplied on request. 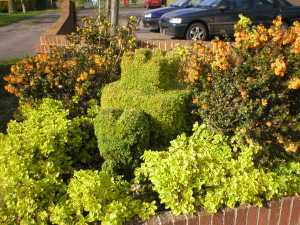 Here's a particular passion of mine: topiary. ("Can you tell what it is yet?") 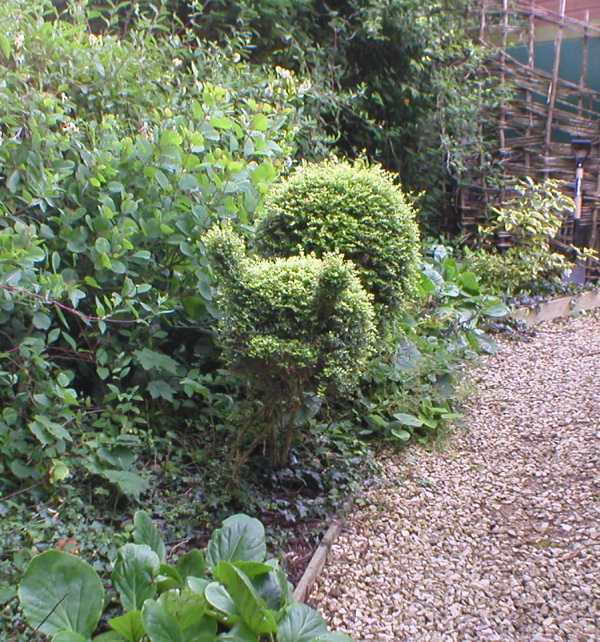 This used to be a fairly neglected small Lonicera nitida bush, and now it's a snail called Brian - well, what else? - and he can be viewed during the biennial Letcombe Bassett Open Gardens day, which takes place in May next year, 2019 - see local press for the exact date. If you look closely at this photo, you can see that he is developing a "baby" at his side: there are now two of them, and he might have to be renamed Bryony. He also had a makeover two years ago, when someone pointed out that I'd shaped the shell incorrectly (Thanks, Jim *grinds teeth*) so I had to cut him right back and start the shell again. My largest gardens are around 2-3 acres, and this is my smallest garden (right): available for public viewing in East Hanney, outside the Village Hall. Not the British Legion hall, round the corner past the mill towards West Hanney. It's a tiny triangle, which measures maybe 10' per side, and was planted up by a lovely lady called Margaret a few years ago, as the council, having built it, didn't seem to be doing anything with it. I took it over a couple of years ago, and I have spent this time making a model castle on top of an elephant (you can tell I'm a Londoner, can't you?). Well, that's what it's supposed to be, but so far no-one has correctly identified it, so I may yet convert it into West Hanney church. In 2009 I was thrilled to be presented with an award for this garden from East Hanney Parish Council, having been nominated as an "Unsung Hero" for maintaining this bed. Thank you, East Hanney! 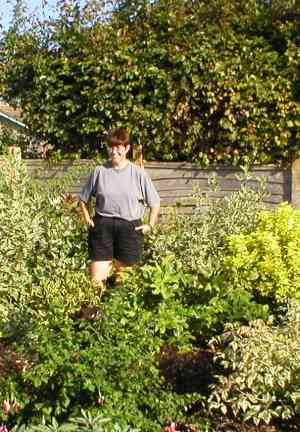 And finally, here I am up to my knees in a shrubbery, which used to be a very neglected potato patch. The owners wanted it cleared and converted into an easy-care area with interest and colour all year round, with the emphasis on contrasting foliage and "easy-care"! This is the result two years after planting: the plants were bought locally or supplied by myself, and were on average about a foot tall when new, so you can see that they've filled out very nicely. Well, that's enough about me: please do have a look at the site, I hope you find it easy to navigate and interesting to read. If you have time to waste, do feel free to take a dive into my blog, which contains How To Do It articles, comments on garden visiting, and general gardening comment. If you wish to contact me about gardening, my phone number is 07867 571682: do please leave a message if I don't answer straight away, as I don't take calls when I'm driving, or when I'm working. Otherwise, do feel free to e-mail me for a more relaxed response, the address is Inquiries@rachel-the-gardener.co.uk. Many thanks to Telestrian for their technical help, including teaching me how to write xhtml 1.0 (strict) which enabled me to build this website. By now you must be aware that the new General Data Protection Regulation (GDPR) has come into operation and, although it sounds ridiculous, even a gardener collects personal data, so you, dear viewer, have the right to know how it is stored and what I do with it (not a lot, but I still have to comply with this new ruling). I've tried to make it as straightforward as possible, but it's still fairly heavy legal stuff. So here we go: ready?! This policy describes how RTG deals with your personal data, when you interact with RTG. What is "personal data"? This includes information such as your full name, address, phone number, email address, and your device's internet protocol address when visiting the RTG blog or website. If you choose to pay RTG by bank transfer or cheque, then it may also include certain of your account details which are publicly available, such as your account number and sort code which are clearly printed on cheques, and which are sometimes detailed in bank statements, depending on how your bank sends the payment to RTG's bank. RTG is defined as the data controller of any of your personal data collected during your interactions with RTG. Contact about your privacy can be made by email to Inquiries@rachel-the-gardener.co.uk. Web log data is collected by Google for the purposes of network and information security. These web logs will contain your IP address and in most cases contain the referring website whose link you followed to reach this site, and information sent by your web browser set in the user agent string. The RTG Blog is hosted by Google, who collect this information. Google records this personal data, on the lawful basis for processing of having a legitimate interest in that data for network and information security. A cookie is a small file of data that a website can set and store on your device that is a possible online identifier. You can normally set your web browser to notify you when you receive a cookie, giving you the chance to decide whether or not to accept it. The cookies on this website are set by Google, and RTG has no control over them or their use: if you are not happy with the website setting cookies, please set your web browser to refuse them. RTG will store and process personal information supplied by you in communications for the purposes of a business relationship. This will include any personal information communicated to RTG, and is likely to include your full name, other contact details and your location information. Collected personal information will be used to efficiently communicate with you and it will also be used in invoicing, design proposals, and other similar documents. Emails are also stored to keep a track of discussions, decisions and for legal reasons. RTG may on occasion share this personal data with others, but only if specifically asked to by yourself: for example, you may ask me to pass your contact information on to a third party such as a supplier/contractor/specialist etc. In certain circumstances RTG will also share this personal data with its professional advisors if it becomes relevant to share the information. These types of personal data will be stored for a period of 10 years. This personal data is collected on the lawful basis of having a legitimate interest in the personal data, to form and maintain a business relationship and for efficient communication. The data is obtained in a way, and used for purposes that would be reasonable to expect (ie you gave RTG this information yourself), it is not harming your rights and interests and has minimal privacy impact to you. RTG will share this personal data with professional advisors in the event of any circumstances that require their attention. Certain of these rights do not apply in all circumstances due to the lawful basis of processing. Your provision of personal data is not a statutory or contractual requirement and you are not obliged to provide the personal data and there are no consequences if you do not provide personal data (other than RTG being unable to get in contact with you). RTG does not use any profiling technique or methods. If you wish to make any changes to the personal information which RTG holds, simply email your request to Inquiries@rachel-the-gardener.co.uk. Disputes will be handled by the customer service representative at RTG (that would be me). The customer service representative will correct any errors and reply to any personal data requests within 1 month. There, that wasn't so bad, was it? Basically I am confirming that I only hold the data that you give me freely, I don't have any mailing lists, I don't pass it on to anyone else, and I guard all electronic and paper information securely and carefully. You can trust me.